LULA Loaders/Unloaders turn on the fastest, most comfortable loading experience possible. The lever engages spring, so rounds slide in and out effortlessly - no finger or mag abuse. 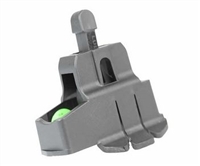 LULA Loader by Butler Creek slips on and off your mag with ease. These Loaders are made in Israel.